We decided that this year, we'd like to feature some of the amazing small businesses that we have within our community. There's so many of you who are in the trenches, some have dug a little further than others, and we kinda like the idea of hearing about the journey of others so that we share with you all, cause let's face it, we are all unofficially stalking everyone these days aren't we (Hello Instagram!). So, we're kicking off the year with this amazing lady. Kimberley is the creator and owner of the coolest online business, OK!Dolls. Helen stumbled across Kimberley via a shout out from Mia Freedman in The Lady Startup group. 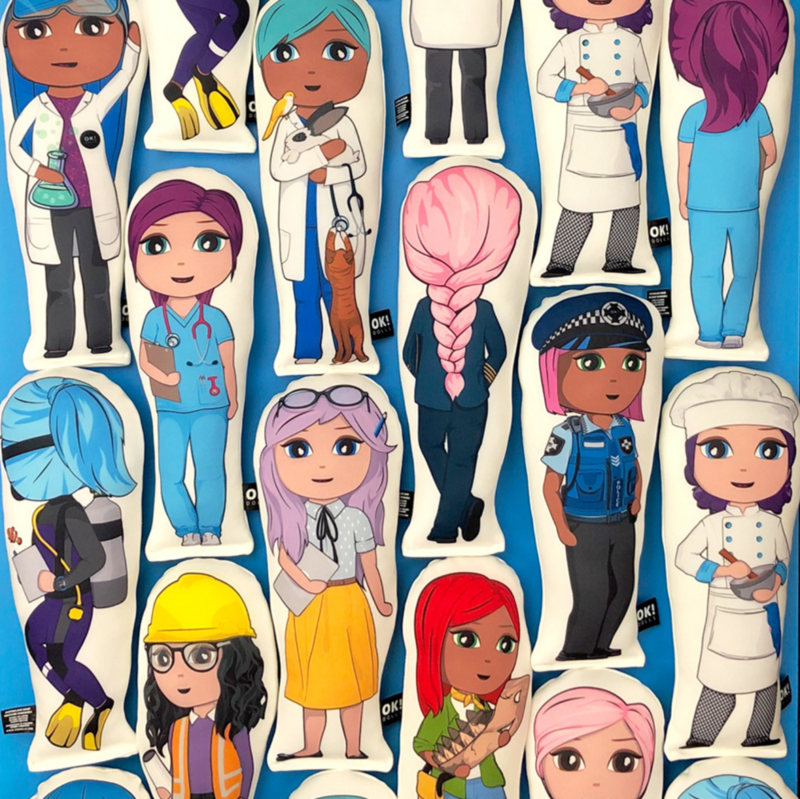 There's a few little girls in my life that are special to me, and I quickly snapped up a couple of these aspiration dolls for their Christmas presents. Like others, we are all starting to get a bit over the 'stereotypes' on female toys, and we're very keen to empower the next generation of women with messages like this. After engaging over on social media (yep, that stalking we mentioned above) for the rest of the year, we thought it would be great to hear Kimberley's tales of startup and know that you'll enjoy it too. Tell us about how OK!Dolls started and how long you’ve been in business. OK!Dolls started in early 2018 with the need to find my daughter a doll that was soft, durable and most importantly aspirational. What I found was that although the gendered signs may have come down in toy aisles, what is stocked on the shelves still remains within a limited scope for imagining what little boys or girls want to play with. Sometimes it’s what is lacking on a shelf that highlights gender stereotypes almost as much as what is there. Kids are naturally curious and learn through play and story making. What they play with sends messages and those messages matter. Finding myself as a new mum navigating gender stereotypes at every turn and playdate, I felt like I had an opportunity to put my words into action to create something that matters. OK!Dolls are about celebrating inspirational real life role models. We often find that a lot of product based businesses spend so much time in the lead up to launching on product development and fulfilment, and not much time or resources on business planning and strategy (which can see them come a little unstuck when they hit ‘go live'. What was your experience? I’m a plan-on-a-post-it kind of person, ideally in three bullet points. I have worked in product businesses that have focused so much on the planning that when they launch there isn’t the wiggle room to shift with the customer and it has given them blind spots. When launching OK!Dolls I had a grand idea and then scaled it back to 6 doll designs and a simple but brand focused website. Essentially I took a page from the tech startups and put their MVP template over a toy product idea. I think one of the bullet points from an initial post-it was ‘iterate and release’ and that’s been key to date. Has there been a pivotal moment/activity/experience in your small business journey that catapulted you to the next level? Perhaps a collaboration/promotion/product that saw a massive sales spiral and/or followers? I’ve had two experiences last year that thrust OK!Dolls in the spotlight. Mia Freedman shared our dolls on the @ladystartups instagram page and then followed it up a few days later with a video on her personal Instagram feed which generated 50k views in a day. Then in October SBS Australia created a video about the dolls and I that ran on their Facebook page. OK!Dolls.com blew up. I remember seeing the spike in traffic and scrambling to check that the website could handle it - I didn’t want our tech to let us down. For a newly launched business these pieces of organic PR were golden. 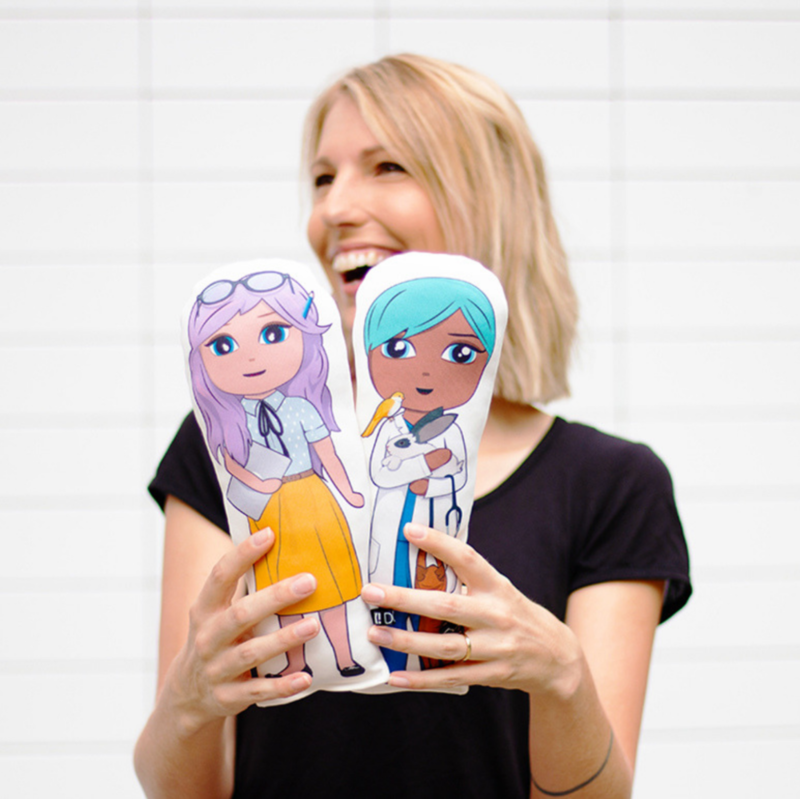 In early 2018 we created two OK!Dolls Ambassador dolls, dolls designed to reflect two amazing Australian women Renee Bauhofer, a Zoologist in Perth and Amber Bourke, a world record smashing Freediver from Brisbane. Both dolls were an amazing success in helping to promote their achievements and raised funds for their respective charities. Looking to plan a little more for your business this year? What is the biggest ‘time waster’ in your business i.e. ; if you could outsource anything, what would it be and why? While I’m hesitant to call it a time waster I am currently in the process of outsourcing the manufacturing of the dolls. To date I have sewn and stuffed every single doll but now is the time to outsource the manufacturing component. A decision to free up some time for other things that I have discovered a passion for like content marketing but also for future growth. Do you have a regular advertising budget within your business to promote your products? If so, do you manage this yourself and how have you learned the skills needed to navigate the Facebook Ads Manager? I manage our Facebook Ads at the moment and yes we have an advertising budget. I think it’s important, like any other part of the business, to play with things and tinker to understand how they work best for your business. I may outsource this in the future but at this stage it’s about building our brand voice and that comes from experimenting. When it comes to budgets I take a chuck each month for experimenting, to try something new with no expectation of return. Ear marking it for play takes the pressure off and surprisingly nearly every time it’s paid for itself and given me a great learning experience. Create your ideal customer profile for your business. What does a ‘day in the life of Kim’ look like? There really isn’t a ‘normal’ day and I’m usually juggling the immediate needs with the future projects. Throw in a toddler and things are always a bit fly-by-the-seat-of-my-pants. My plan this year is to batch everything and try to have specific days for doing things so that all areas of the business get some love - rather than the urgent or the things I love to do always taking my attention. Who do you go to for advice/inspiration/motivation? (Maybe, favourite podcasts and/or bloggers or social media profiles). For motivation I find learning new things invigorates and supercharges my mindset. Hearing someone else’s story can be inspiring but I’m truly motivated by taking an idea and trying it out, that shift from idea to thing. Whether it’s something to do with the business like learning animation for a marketing idea I have or a personal side project, it lights that spark. I listen and read A LOT. When I’m cutting or sewing OK!Dolls I always have my headphones on listening to a podcast. At the moment the list includes How I built this by NPR, Ecommerce Masterplan, Goaldigger by Jenna Kutcher, Talk Social to me by Stevie Dillion, Mums with Hustle by Tracy Harris and The Tim Ferris Show - his conversation with Seth Godin crystalised a lot for me. Looking back on your journey, if there was one thing you’d tell your (1) month old self what would that be? That this little idea will work and stop thinking of it as a side hustle. It took about 5 months before I realised it was no longer a side project and could be a thing. And invest in Facebook ads now - don’t wait. How do you manage the juggle between work, family and self (ha!). Any tips for our followers? I’m in a pretty interesting situation as both my husband and I have our own businesses and work from home in a shared workspace. We spend a heck of a lot of time together however often we both have headphones on and heads down. Our mindset is that during 9-4 work hard so come 5pm we can both stop completely. Once our daughter is in bed then it’s work time again, that’s when you’ll find me on our social accounts. One of the joys about working from home is there is no commute or time wasted battling traffic so instead every morning feels like a Sunday in our house. This is important family time that fills my cup. Time for myself would be those times during the work day where I value the time taken to learn something new rather than pushing it to one side for later. Self care for me is about nourishing my brain and my need to learn, trying new things and creating. Kimberly is the creator behind the brand of empowering fabric dolls OK!Dolls. A former Design Technology & Robotics Teacher who went on the search for a doll for her then 1 year old daughter. When she couldn't find one that was stylish, durable (aka machine washable) and aspirational she set forth to create it. Toys have the a powerful place in a child's world by supporting their growing sense of self through play. What they play with matters and it matters to OK!Dolls.